Do you wish to rock during your next promotional campaign or tradeshow, feel free to avail this promotional product - a customized guitar shape bottle opener music keychain. It may not bring you million bucks for electrifying performances, but it will definitely make you stand out in crowd. This guitar shape bottle opener music keychain holds a funny shape and it is perfect for managing keys and plucking bottle necks. It is perfect for promoting musical bands, music classes, music supplies, CD stores and many more. 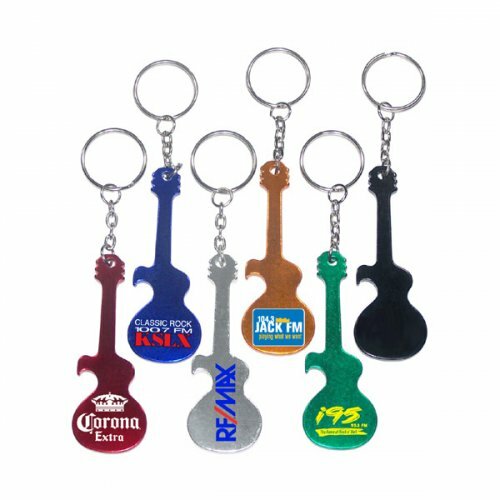 Request a quote to know about wholesale price savings on promotional guitar shaped bottle opener keychain. Features – Guitar shaped aluminum body in metallic finish. 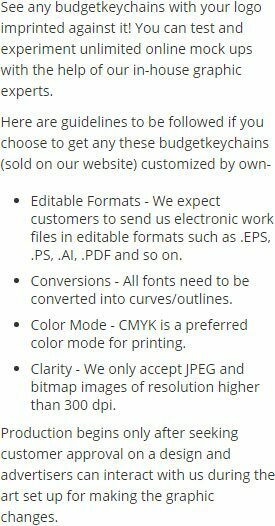 Product Size – 3" x 1 1/16"
Available Colors - Metallic Black, Metallic Blue, Metallic Green, Metallic Gold, Metallic Orange, Metallic Red, Metallic Pink and Metallic Silver. Imprint Method – Printed, Full Color Process & Laser Engraving. Imprint Area : 3/4" x 5/8"
Product Size : 3" x 1 1/16"
Product & Design Quality -Very good quality and loved the way the custom logo was created. For a small item, the logo printing came in very clear. I also really appreciated the individual bags for each keychain. That was a nice touch. Customer Service & Shipping - I thought the customer service was outstanding. I received phone calls during the process and I thought it was great to speak to a live person. Shipping was quick and I was told of the status at every step in the process.